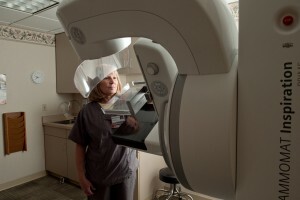 Adding 3D mammography to your traditional mammogram increases cancer detection and reduces false-positive results, according to a study published last year in the Journal of the American Medical Association. Also known as breast tomosynthesis, 3D mammography is a type of digital mammography in which X-ray machines take pictures of thin slices of the breast from different angles, the National Cancer Institute says. Computer software reconstructs the image. Memorial Medical Center will offer 3D mammography at two locations in Springfield beginning this fall. Memorial Breast Diagnostic Services will offer the screenings at Koke Mill Medical Center in the Mammography Department near Koke Mill ExpressCare and at Baylis Building at Rutledge and Miller streets. Breast cancer is the second-leading cause of cancer death in women, second only to lung cancer, according to the American Cancer Society. More than 230,000 women in the nation are expected to be diagnosed with breast cancer this year. To understand how 3D mammography differs from the traditional 2D mammography, imagine a loaf of bread with a marble baked inside. If you examined the bread loaf unsliced, you might see the marble or at least see an indication of where it might be located, but it would be more difficult to pinpoint; that’s 2D mammography. But if that loaf of bread were sliced and you could pull out each slice to examine it, you could easily pinpoint the marble’s location. That’s 3D mammography. The greater number of images increases the opportunity for the radiologist to catch a questionable spot. The 3D process is similar to a traditional mammogram except while the machine remains stationary for the traditional mammogram, the machine rotates in a circular arc around the breast for the 3D procedure. The 3D procedure is particularly beneficial for women with dense breasts; the dense tissue makes it more difficult to spot cancers using traditional mammography. The 3D mammography unit will be in a booth near the entrance to the health screenings section of the Be Aware Women’s Fair, which will be held from 9 a.m. to 2 p.m. Saturday, Oct. 3, in the Orr Building on the Illinois State Fairgrounds. Participants will be able to see how the unit moves and works, said Lowers, who also chairs the fair’s organizing committee. A technologist will be on hand to answer questions, and women will also be able to schedule their mammograms while at the fair. To schedule a mammogram with Memorial Breast Diagnostic Services, call 217-788-4042. For more information about Memorial’s Be Aware Women’s Fair, visit BeAwareWomensFair.com.